One of the Algarve’s top getaways, Albufeira has wild nightlife, an inexhaustible choice of activities and many world-beating beaches. A whopping 25 beaches fly the Blue Flag here, which is more than any other municipality in Europe. Safe to say, much of your time will be whiled away on golden sand, with ochre cliffs, azure surf and warm sun. And despite Albufeira’s reputation for parties ’til dawn, the centre of town is a long way from all the craziest nightspots. This quaint old quarter is altogether more Portuguese, and has restaurants serving fish and seafood caught by the town’s fishing fleet. This six-kilometre beach on the way to Vilamoura encapsulates the best of the Algarve. There’s a long, spotless strip of golden sand bordered by continuous cliffs. These are layered with red and yellow limestone and seem to change with the angle of the sun. You can walk the length of the beach on a path on the cliff top, with access to the beach below by steep stairways. With only isolated apartment buildings and villas on the cliffs, Praia da Falésia has a remote, untouched quality. Kids can spend carefree afternoons building sandcastles and hunting shells, and when the tide goes out there are broad knee-high shallows to play in. 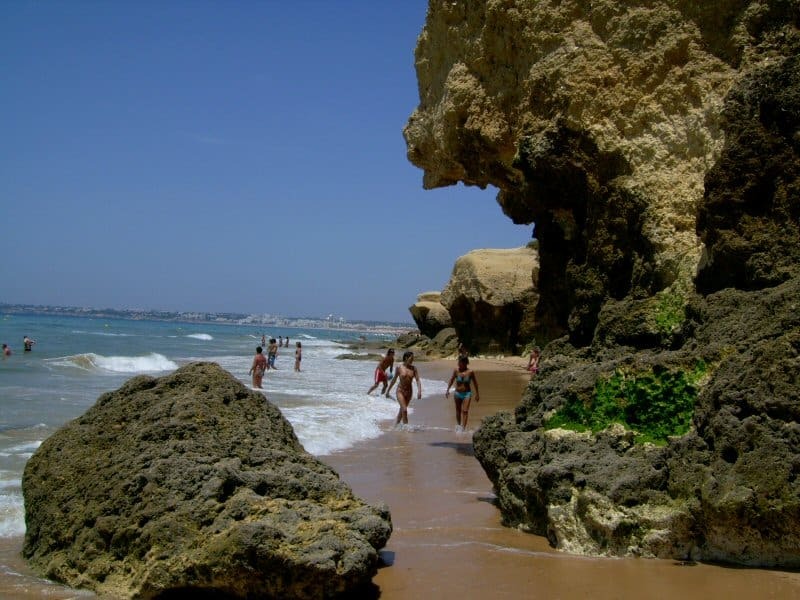 This stunning beach is a bit closer to Albufeira’s old town but totally removed from the resort. It owes its remoteness to a rugged foreshore, which you’ll cross with the help of raised walkways. There are strange rocks on three sides of the beach but also strewn on the water’s edge. These are streaked with yellow, orange and red and rise in gnarled boulders and funnels. The outcrops help to shield the beach from the wind and the surf is no more than a ripple on calmer days. 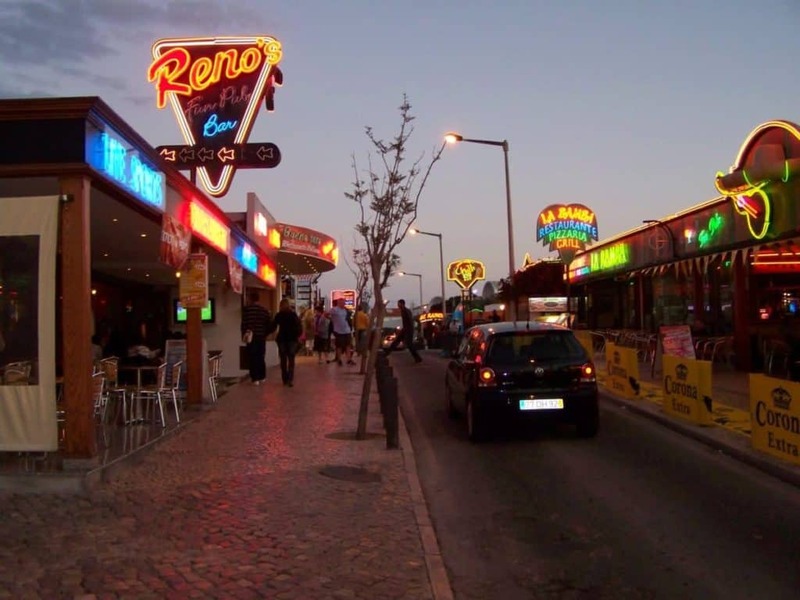 Going out in Albufeira is a very different prospect depending on where you’re based. If it’s the old town there are squares with quaint seafood restaurants, cafes and typical Portuguese bars where you can sip a cold glass of sagres and chat. But a couple of kilometres east is the neon mayhem of the “The Strip”. Avenida Dr Francisco Sà Carneiro is a north to south thoroughfare that gets crazier the closer you get to the beachfront. There are bars, nightclubs, amusements, fast-food joints , and pretty much everything else for young people who want to paint the town red. The historic centre of the town is great to idle around for an hour or so. It has meandering streets that taper to little more than arm span, through ravines of whitewashed houses. Many of these alleys have “Portuguese pavement”, laid in pretty patterns . 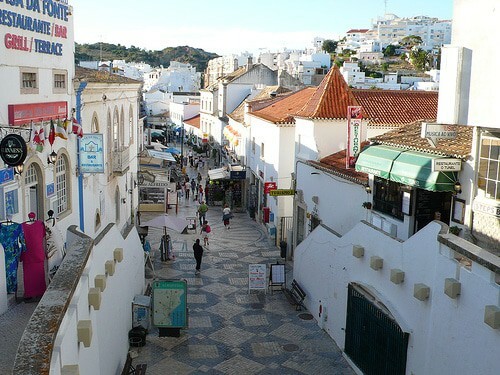 The older part of Albufeira is on high ground, and you’ll find yourself turning a corner and being treated to the sight of the ocean across Praia do Peneco. Down below there’s a foot tunnel through the rock, taking you straight from the pedestrian street Rua 5 de Outubro out to the beach. 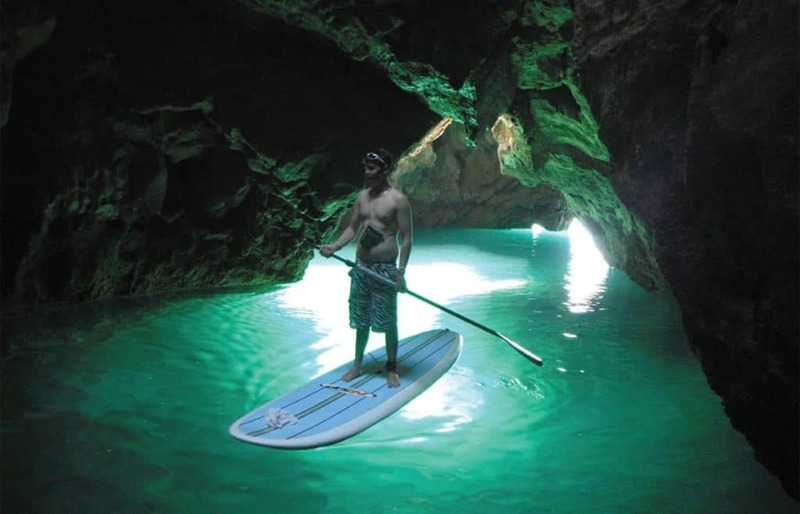 In between the phenomenal beaches, Albufeira has a coastline dimpled with caves, and the only way to approach many of these is by water. That’s where the many companies arranging kayak, canoe and stand-up paddleboard excursions come in. You’ll be instructed on safety and get expert guidance, and in many cases your guide will be wearing a GoPro, recording a keepsake of your trip. The waves on Albufeira’s western beaches are often surfable, while the consistent breezes allow for windsurfing and kitesurfing almost any day. Equipment hire and tuition are always on hand at the resort. West of Albufeira there’s another long natural beach that feels far removed from the neon and noise. The eastern end of Praia da Galé has bluffs and clusters of rocks, hiding pools and caves that are fun to explore if you keep an eye on the tides. This is also the most built-up part of the beach, with restaurants and bars ensuring a little more comfort and convenience. As you go east the scenery flattens out and things get a little quieter, but there are still a few low outcrops scattered along the shore, which kids will love clambering over. The essential day out for families in Albufeira, this attraction has marine animal demonstrations alongside a waterpark. If you’re concerned about animal welfare you might be glad to see that Zoomarine Algarve comprises the only wildlife rehabilitation centre in the region. There are also habitats for a variety of animals including alligators and tropical birds, as well as arenas for dolphin, birds of prey and seal/sea lion presentations. Add to these shows with stunt performers, a 4D cinema and the pools, wave beach, rapid river and water slides in the waterpark. With bluffs and steep hills, Albufeira has a few spots where you can stop and just enjoy the scenery. The easiest to find is this one on a rock between Praia do Inatel and Praia do Peneco. You’re at the southeastern corner of the old town you can gaze back across the bay and over the picturesque townscape of whitewashed houses rising up the hill. There are escalators lifting you up to this perch and a handful of benches under a metallic canopy, pointing towards the town, beach or sea. 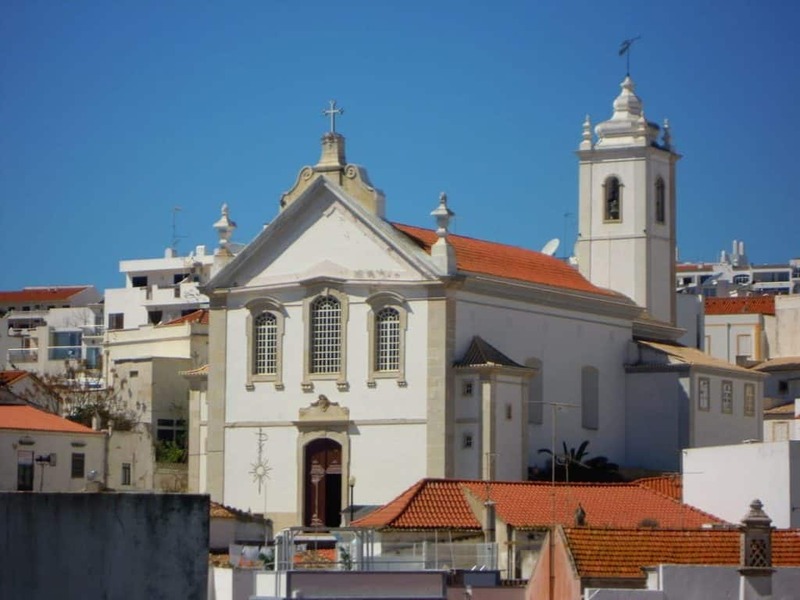 Albufeira’s main church is from the end of the 18th century and has dignified Neoclassical architecture. There’s a barrel vault, with filigree stuccowork on the ceiling and a modern altarpiece designed by the Algarve artist Samora Barros. The real interest lies in the Marian statue of Nossa Senhora da Orada, sculpted in the 1400s. This is the patron saint of Albufeira’s fishermen, and every August 15 there’s a procession carrying this image from the church down to the 15th-century hermitage of Nossa Senhora da Orada, where it was originally installed. The route also includes a small voyage from the marina pier to Praia do Inatel. The most secluded and natural of all the beaches in the Albufeira municipality is this stretch bordering a lagoon. It’s almost redundant to say that the beach is spotless, and almost every beach in Albufeira is a perennial Blue Flag recipient for cleanliness. But it’s the total absence of buildings, apart from the far-off village of Armação de Pera and a single restaurant, that makes you feel at one with nature here. Unlike most of the other beaches in the area, this one faces west so is more open to the ocean breezes, has vigorous surf for watersports and gets beautiful sunsets. There’s a boardwalk to the rear that grants views of the Salgados lagoon, which teems with birdlife in autumn and spring. 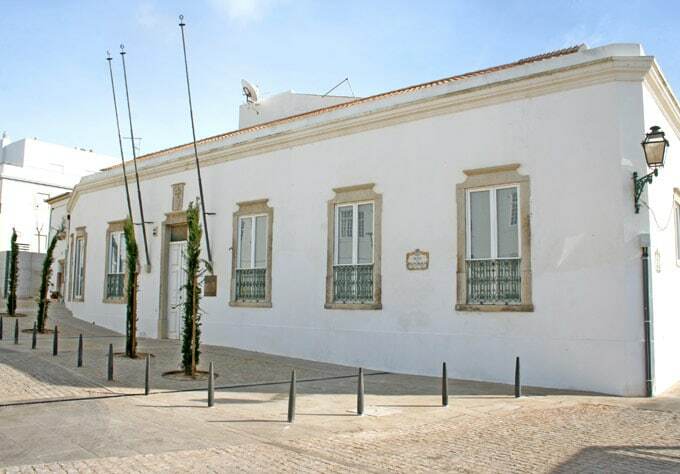 In the compact historic core of Albufeira, the archaeological museum is in the former town hall on Praça da República with views of the sea. It’s for anyone curious about the different cultures that have called this place home down the ages, and there are artefacts from prehistory, the Roman period, Islamic Period, medieval Portugal and the Early Modern Age. Some highlights are a Neolithic vessel, architectural fragments from an excavated Roman villa and sacred art recovered from Albufeira’s old church. 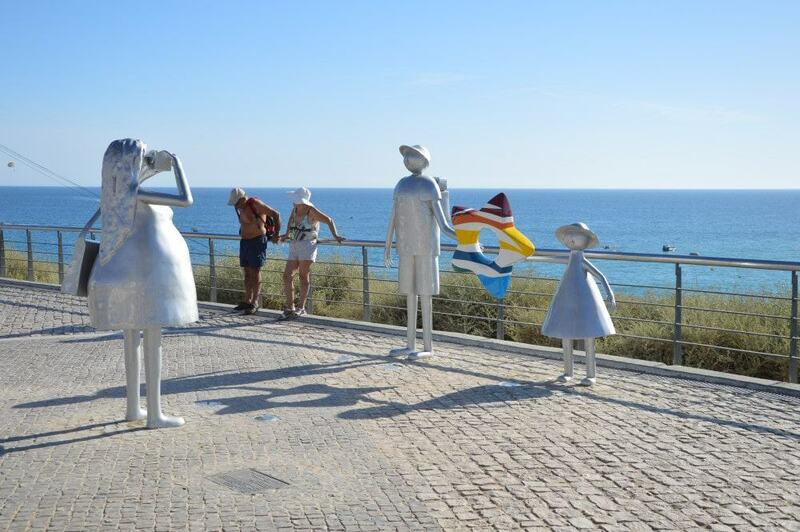 What’s impressive is that most of this collection was assembled by one man, Padre José Manuel Semedo de Azevedoa, a priest and head of Albufeira’s tourist commission in the mid-20th century. The upside of the being in one of the Algarve’s busiest resorts is the fantastic array of things to get up to when you want a day away from the beach. On land this can be treks, pony rides, hacks and lessons at one of the two equestrian centres near Albufeira. For petrol-heads there are quad-biking trips into the hills, scrambling through dusty scrubland and discovering the little villages north and east of Albufeira. 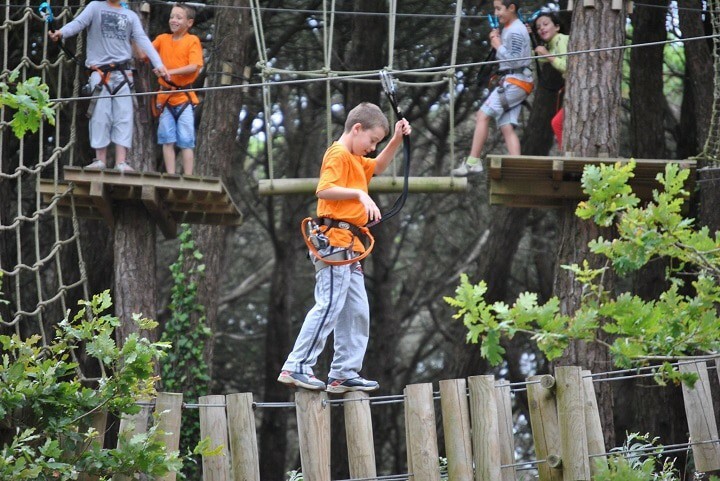 And for families Luso Aventura Albufeira is an adventure park, with walkways, ziplines and rope bridges suspended beneath the canopy of stone pines like a tree village. There’s no danger as you’ll be wearing a harness and hooked up to a safety line. 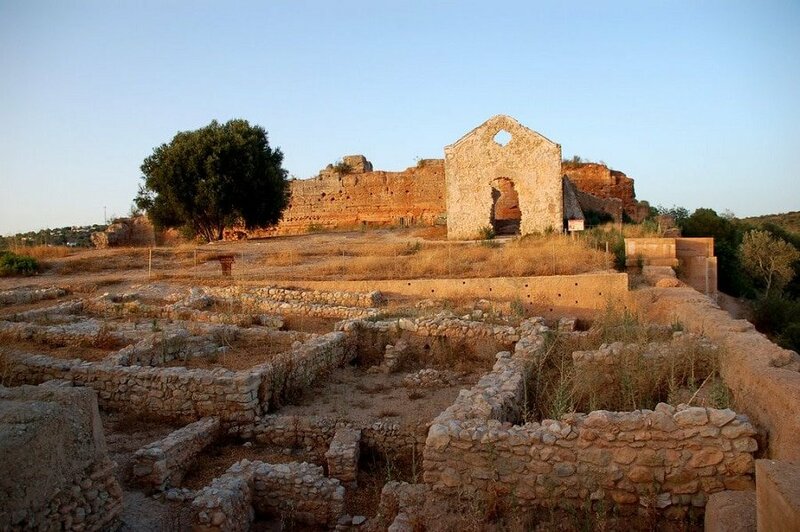 For a bit more history you can investigate the ruins of a medieval castle a short way from Albufeira. The castle rests on a promontory at a kink in the Quarteira River, in an arid Mediterranean landscape of olive groves and carob trees. The structure is in ruins but there’s a lot remaining, with archways, thick walls and the shell of chapel to adventure through. It was built by the Moors in the 12th century during the time of the Christian Reconquista and was captured in 1248 after a massacre. This castle is one of the seven that appears on Portugal’s coat of arms. Down the hill you can also find a small bridge over the Quarteira from the same era. 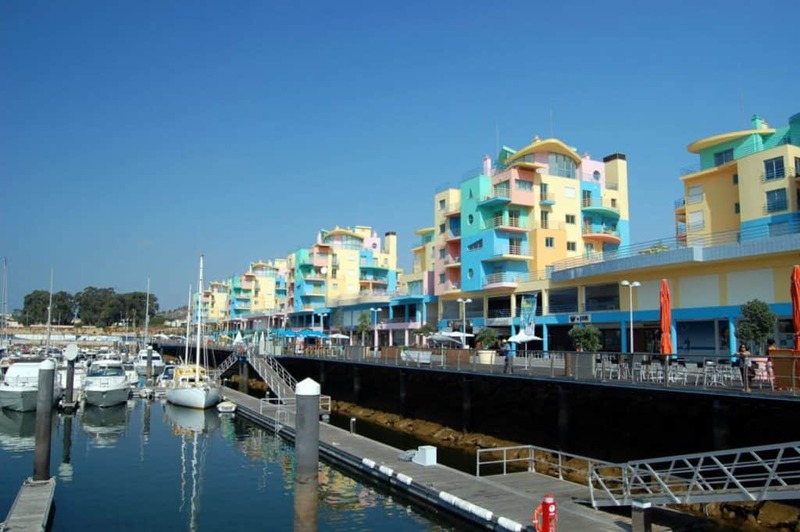 Albufeira’s marina is the stepping stone for adventures on the waves. Sailing lessons and yacht charters are on offer if you want to take the wheel. But you can also set sail on an organised cruise along Albufeira’s unmatched coastline. Normally you’ll get to enter those caves, stop off at a quiet beach for a barbecue and if the seas are calm, will be able to dive off the side for a swim. Nature abounds in these waters too, and dolphin-spotting trips offer a great chance of spotting pods of bottlenose, Risso’s or common dolphins in the wild. With the Atlantic lapping at the shore, and a small community of fishermen still working in Albufeira you can bet that fish and seafood should be on the menu. 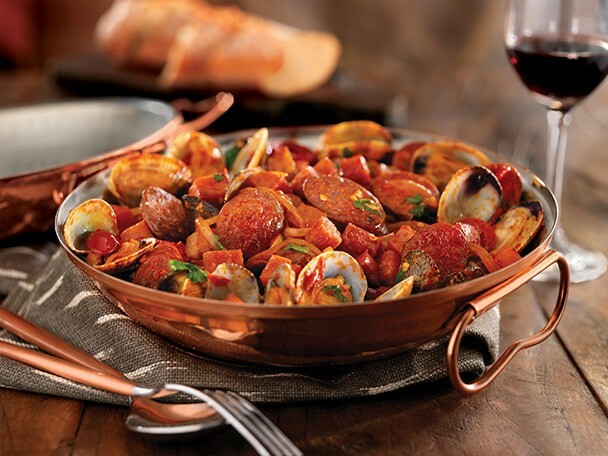 The signature dish across the Algarve has to be cataplana, a stew named after the metallic cookware it’s prepared in. The recipe can vary, but it will normally have some combinations of clams, mussels, shrimp, scallops and lobster in a tomato broth. Caldeirada is another delicious stew, this one including a blend of white and oily fish, as well as mussels, clams, squid and other seafood simmered with tomatoes, peppers and potatoes.